The floods of March 2009 went down in the record books as the most severe Fargo, North Dakota, had experienced in its history. The Red River reached a record high of 40.82 feet as it flowed through Fargo on March 28. (See Flooding on the Red River for images of the flood.) Flood stage for the river is 18 feet. The Red River of the North, which forms the border between North Dakota and Minnesota, has a long history of severe floods. Major floods include those of 1826, 1897, 1950, 1997, and now 2009. The 1997 flood caused billions of dollars of damage, with greatest impact to the city of Grand Forks, north of and downstream from Fargo. The repetition of flooding in the Red River basin is mostly due to its topographic setting and geologic history, as illustrated in this image. Made with data from the Shuttle Radar Topography Mission (SRTM), the image shows ground elevation in shades of green, tan, and white. Low-elevation areas are green, while higher elevation regions are tan and white. In the United States, the Red River lies in a trough that was shaped by continental glaciers about 10,000 years ago. The lowest elevation feature on this image, the trough is about 70 kilometers (45 miles) wide and tens of meters (very generally about 100 feet) deep. Near Fargo, the trough narrows to about 190 kilometers (120 miles) wide. South of Fargo, this narrowed pathway splits into two distinct paths (broad green swaths on the image) that were carved by the southward-flowing glaciers. Deposits of rocks left by the glaciers form ripple-like hills near the split. Ideal for transporting rivers of ice, this landscape is not ideal for transporting water. The trough carrying the north-flowing Red River decreases in elevation only 40 meters (130 feet) from Fargo to the Canadian border over a straight-line distance of 235 kilometers (145 miles). This is a gradient of only 17 centimeters per kilometer (11 inches per mile), and the actual river gradient is much lower as it follows a longer, curvilinear path. The change in elevation is barely visible in this image, evident only in the slightest darkening in green from south to north. Areas surrounding the trough are steeper, more rugged, and higher in elevation as shown by their lighter color in the image. This is a fundamental cause of flooding in Fargo. The steeper slopes and merging streams around the city concentrate water runoff into the glacial trough at Fargo, while the lower gradients within the trough allow the water to spread (and flood) but not drain quickly away. Elevation data used in this image were acquired by the Shuttle Radar Topography Mission aboard the Space Shuttle Endeavour, launched on Feb. 11, 2000. The mission was a cooperative project between NASA, the National Geospatial-Intelligence Agency (NGA) of the U.S. Department of Defense, and the German and Italian space agencies, and was managed by NASA’s Jet Propulsion Laboratory, Pasadena, California. NASA image created by Jesse Allen, using SRTM data provided courtesy of the University of Maryland’s Global Land Cover Facility. Caption courtesy NASA Jet Propulsion Laboratory, edited by Holli Riebeek. The full caption is available on the JPL Photojournal page. 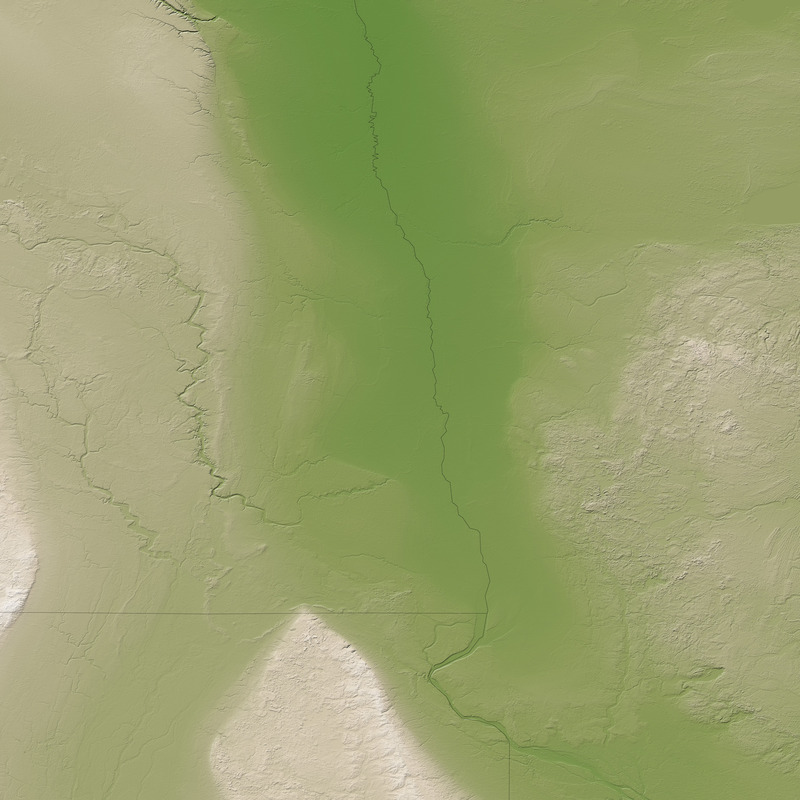 Repeated flooding in the Red River basin is mostly due to its topographic setting and geologic history, as illustrated in this image of the ground elevation near Fargo, North Dakota. Photojournal. (2009). PIA11964: Fargo, North Dakota, USA. NASA Jet Propulsion Laboratory. Accessed April 3, 2009.